A World Record is shattered! We would like to thank EVERYONE who helped out with this project. Specifically, we would like to thank Jake, Jason and Tim from Southern Exposure. They were not only a pleasure to work with, but provided the knowledge, experience, and the firing system required to launch all 3,973 rockets simultaneously. Secondly, would like to thank Mrs. Joan Burke for designing us this awesome website! She has tirelessly been updating the website with the latest news and pictures of our project. We would like to thank our parents, who were so willing and eager to stand by and support us throughout this project. Next, we would like to thank Michelle Marquez and the PAN Initiative for providing aerial drones for the launch. They made us realize what a great platform Rocket4theCure provided to inspire a new generation of dreamers and go-getters. 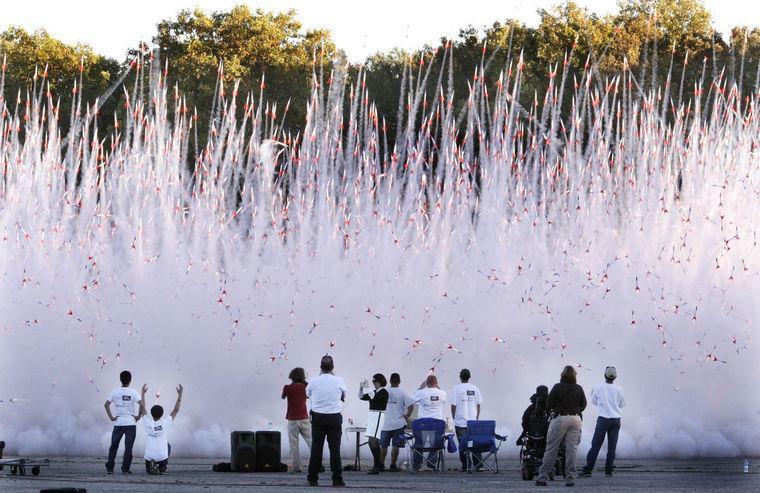 We would like to thank the many friends and family who selflessly helped construct all 4,100 of the rockets. Lastly, we would like to thank the launch-day crew who spent 10 grueling hours on their hands and knees wiring the rockets together. We had well over 2,000 man hours logged throughout the entire project. We are so thrilled that our community was so supportive of Rocket4theCure; this project would not have been possible without the time dedicated by everyone above! If we could thank each person individually, this note would stretch pages.